The Untamed Nam Wa River is located in the province of Nan in the remote Northeast of Thailand. Although Nan has been accessible to foreign tourists for several years, it is one of the least visited areas and offers visitors a unique taste of untouched Thai culture and rural life. 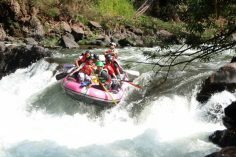 The Nam Wa River was first run by us over 15 years ago and although seeing more rafters now is still relatively unspoilt due to the out of the way location and the effort required to see it.